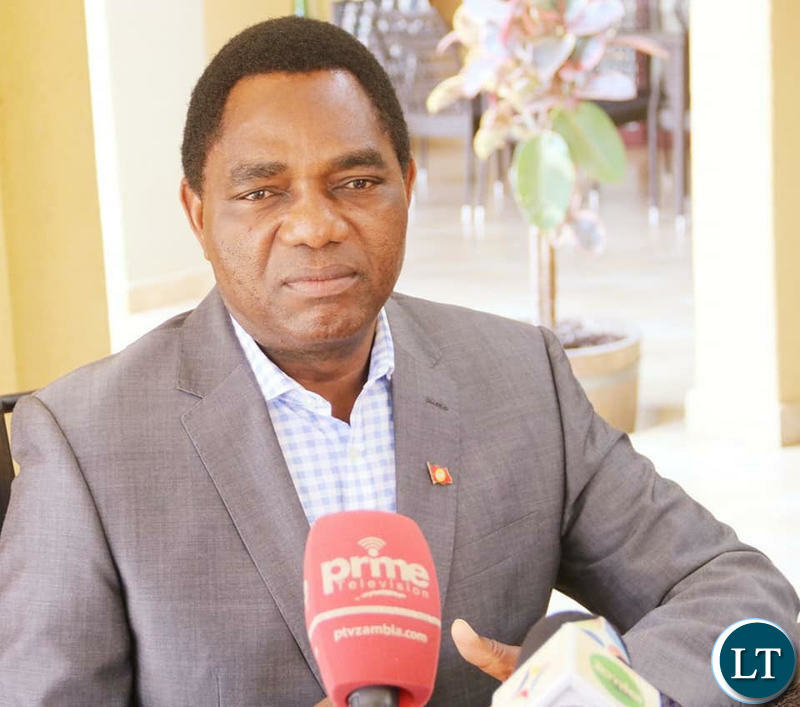 UPND Leader Hakainde Hichilema says President Edgar Lungu’s arguments that Infrastructure Development Minister Ronald Chitotela cannot be fired on grounds that he is innocent until proven guilty has set a very bad precedent for the country. Mr. Hichilema says the offences slapped on Mr. Chitotela so far are a mere joke as they do not match what we believe is a grand corruption matrix which implicates a number of very high level PF politicians and government officials. He said going by President Lungu’s arguments, it is now highly irregular for any organization in the country to dismiss or indeed put on suspension or on forced leave any of their erring employees who are facing disciplinary action until their matter has been determined. “This means all the more than 80 officers, including the Permanent Secretary, who are currently on suspension from the Ministry of Education on mere suspicion of financial embezzlement must immediately go back to work until their matter has been concluded”, he said. Mr. Hichilema said former Minister of Community Development Emerine Kabanshi and her officers plus the Post Master General McPherson Chanda and his officers who were dismissed on mere allegations of misusing the Social Cash Transfer Funds must immediately resume work until their matter has been determined. He said the UPND is also aware that there are a number of account stuff and officials at the same Ministry of Infrastructure who are currently on suspension on mere suspicion of financial embezzlement, and these must equally be allowed to go back for work. Mr. Hichilema said there are several other public service and private sector employees that are on suspension or on forced leave facing disciplinary hearings or are in court facing various charges, who must equally go back to work until their matters have been determined. “In fact, some of the affected officers in both government and private sector are on suspension, forced leave, facing disciplinary hearings when they have not even been arrested by law enforcement agencies. Bank tellers, teal operators in shops and other companies on suspension or on forced leave on suspicion of financial embezzlement must equally go back to work”, he added. Mr. Hichilema said as a suspect going through court hearings, Mr. Chitotela will still be flying the pride of the Zambian flag, representing the country at both local and international stage, proudly meeting various dignitaries, and later drive the ministerial vehicles to court. “In fact, going by President Lungu’s arguments, had Mr. Chitotela been charged with a none boilable offence, he would have been coming from Chimbokaila prison on daily basis going for work. And yet, in normal circumstances, the mere act of being arrested by law enforcement agencies should have triggered a resignation voluntarily by Chitotela on moral grounds, Mr. Hichilema said. He said going by the media reports on the alleged plunder and corruption going on at Mr. Chitotela’s Ministry, it fully confirms that he is indeed a special Minister who is blackmailing the top core of the entire PF leadership. He said like the UPND has repeatedly said, when these people are plundering, they are equally hell bent in trying to divide as a country so that we don’t unite together to liberate ourselves, yet they are not sharing their loot with anyone. Mr. Hichilema said it is time we united together as citizens as we are all suffering at the hands of these economic saboteurs. This chap is ever negative, what a shame. Is he even Zambian? Imagine if Chitotela was working for Shaka Zulu, and accused of receiving gifts from white settlers, and building his own village. What could have Shaka done to Chitotela? Double h, you are embarrassing yourself. Chitotela has not been suspended or sent on forced leave. Why do you like misfiring? Why? Oh why are you so wicked. The speed at which all these assaults are coming may lead us to speculate that you’re doing everything within your means to sow discontent and acrimony in the nation. First your vice went before you and ushered in an assault at the POTROZ that he is frustrating Chitotela’s presidential ambitions. Quite incoherent, then here you are, misfiring and giving wild analogies. Oh double h, how naive can you get. Do you have advisors. I can’t understand your view and how it differs from your vice. Did you engineer the current circus? Tell us what wild comparisons ?? Is one corruption allegation more important than another ?? But he makes sense on this one!!! Lungu is the chief architect of corruption and stealing in this thieving OF Government. Lungu is simply saving his own image by defending Chitotela crook. I fully agree with HH. Fairness needs to be applied to all. The corruption issue was a mere gimmick to make the world bank think Lungu was serious about corruption when in fact not. Why is the 1 million fire truck and many others not been investigated. LT also, why duplicating my comments? Hehehehe…..you are failing to tell us why corruption allegations must be selective…? LT its bad precedence not precedent. I thought you were thinking President but meant precedent for precedence. HH I’m with you on this one. Good stuff. Imwe, HH alifulungana seriously. From the time the chap came out of the Mukobeko jail, things have just been going from bad to worse. The President Edgar Chagwa Lungu agve a very clear, simple example of what happened to Kambwili. Kambwili is no longer a Minister, the ACC accused him of corruption, am sure insunuated by HH and UPND but its now almost a year and Kambwili is free, hence the President’s Constitutional stance of “You are innocent until proved guilt”. What a shame ba HH, dont embarrass yourself by being cheap and trying to hoodwink people. You are a failure and must step down from misleading the good Tonga people. HH is saying what of the civil servants suspended on allegations of corruption ?? Tell us the the difference ?? The civil servants are charged directly for some offences related to their line of duty. They mishandled the social cash transfer and or were fraudulently obtaining money from the ministries (education or Community development) hence their removal to facilitate a forensic audit. In the case of Chitotela, so far he has only been charged for concealment – being ownership of the properties in Makeni and Ibex hill that are currently under the name of one Diris Mukange. The catalogue of supposedly illegal transactions being reported by the News Diggers! are yet to be tabled and have him charged for possible money laundering. …cannot substantiate the allegations and proceed with the prosecution and then he loses Chitotela. We may need to take a leaf from events taking place in the US. The target is the POTUS but the Counsel appointed hasn’t demanded that DJ Trump must step aside as with all his powers he could influence or affect ongoing investigations. Instead, he has professionally proceeded with his investigations and managed to indict two aides to the President. HH et al would do well to encourage the investigative wings by helping them with tangible evidence and ensure that case is seen through to prosecution. HH is very right and the PF rats are bewildered by the actions of lungu……reinstate all those on suspension pending corruption invesigations …..
Or can the PF rats tell us what the difference between chitotela and others suspended ?? Are you PF rats saying corruption allegations against some, like ministers are nothing ?? Is it the case that Only civil servants are affected by these allegations where they are suspended pending investigations ?? What Mr Hichilema has stated concerning sending someone on leave if they are being investigated is the correct practice in both private and public offices. HH is right. Please people who are advisers to the president should kindly remind him that there are civil servants who are on forced leave or suspension to allow investigations carried out without interfering with data related to their cases. Please those who are close to the president should quickly advise him to ask Mr Chitotela to stay away from the office until his case is sorted out. He should not fire him but suspend him from duties because before the law he is innocent but he can not sit in the ministerial office whilst the investigations are going on. One thing everyone should accept that every parent loves their children and disciplining children is part of showing them love because you want them to be well in future and set an example for other children not to do wrong things. The president must just do that . Patriotic Front has many people who can help him continue with developmental projects and leading this nation. Just like when Mr Sata died people were wondering who will lead the nation and today President Lungu is there so our president should remember that the voters gave him the mandate to protect the national assets and everyone found or suspected to be stealing must be disciplined without fear or favour. May the Lord give him strength to do the right thing. HH is right kwasila. I know PF looters will always argue from without because they are benefiting from the loot. That is PF and lungu for you, corrupt to the core…….anything is possible. I agree that Chits should be on suspension if he already isn’t. All politicians in Zambia come from the same school of thought. Its funny HH criticising President Lungu being lax about freeing criminals until proven. Er…about that treason charge, how is it you beat it? Did President Lungu act the same way and allowed you your freedom rather than apply the correct process? The bottom line is ACC and the Judiciary in Zambia have a tough time with correcting politicians. Don’t be a hypocrite. Ba HH which precedence. Why forget what you yourself has done. William Tekere Banda was condemned for turning this country into hell where MMD cadres territorised innocent the act you condemned as UPND. Today Banda is your chief adviser and what he says is damn good. Nonsense. Was Banda a civil servant for which he could be suspended ?? Was he accused of corruption ? This is simple, ACC and other organisations should do a good job so that once they arrest somebody, have solid case and things are brought to completion soon while the person is on suspension. Instead of fixing the broken system, Lungu is ducking and giving excuses. There is no leadership here from the president. It means if Kambwili apologises for the insults, will be welcomed in PF. Thus us we challenge Lungu, fix the system or resign instead of giving excuses. That is no leadership. He even entertains ACC people at state house for opinion and then Kambwili is fired. Cry my beloved country. HH is ideed an under five (5)chap when it comes to politics.He wastes his energy on trivial matters.I wish he can remember the way the late Micheal Sata Was playing a game of politics not just hatred. Just counter what HH is saying, instead of using inuendoes , are the civil servants suspended because of corruption allegations against them less special than ministers in lungus inner circle who are accused of corruption ???? Clearly Chitotela needs to step aside until the matter has been disposed of, Not to say he should be fired or denied pay now but needs to excuse himself from performing his duties because his image has been tainted. No he hasn’t, he has shown good leadership and temperament. A Man is innocent until proven guilty. As we speak the whole President of the United States of America and key members of his administration are under investigation, but they are still serving in office even while indictments and arrests are being made. It is injustice to try people by opinion and on social media. Do unto others as you would have them do unto you. Fact is Chitotela was arrested. Get your facts right, the US President and members of his administration have not been arrested yet. HH is the most dangerous man in Zambia. This is where you have run too……you have not answered above questions ……what of the suspended civil servants who have been relived of duties pending investigations ??? Are corruption allegations against ministers more special ? ?, why the selective fight against corruption ? @Spaka, mate, stop boiling at the mouth and Google this; ( Check this case; quoting Guardian Newspaper, ‘Fiona Onasanya’s car was doing 41mph in a 30mph zone. A Labour MP has been suspended and urged to resign from parliament by her party AFTER being found guilty of repeatedly lying to avoid a speeding ticket.) End quote.’ His Excellency exonerated, thank you. I know you PFs can not differentiate being accused of stealing money , which is what corruption is and lying about a speeding ticket…. in any case I know this case well…..she played the race card well….. Okay let’s look at other countries then. Clearly there is constitutional issues at when to suspend d an MP if suspected of a crime like all of us ordinary citizens, we are free till proven even murderers. Currently in the UK, a black African MP lied about a speeding ticket. It went to trial and she was found guilty of lying etc, is going to jail and yet she has only been suspended by her Party, although she is still an MP until she resigns so by-election can be held. ( Check this case; quoting Guardian Newspaper, ‘Fiona Onasanya’s car was doing 41mph in a 30mph zone. But PF see stealing money from poor people as the same thing as trying to doge a speeding fine….. I have doged speeding and parking fines. I don’t consider this the same level as stealing money , corruption. @Spaka it’s NOT about parking tickets it’s about innocence until proven guilty, but being UPND you don’t understand justice. Chitotela has not stolen but is accused of failure to declare. Another example of the ongoing Investigstions in the Trump administration, but again it’s gone over your head! You are always name calling, making wild allegations and you don’t understand things properly. It’s constitutional at what point the suspension can be made. When the MP can design. It’s understandable UPND want another by-election to front their chance! So then , what of all the other civil servants made to take forced leave to pave way for investigations ??? Should accused be left in the job while investigations are on going ?? @Spaka, don’t know the nature of those suspensions. It is worth considering if those suspended MPs could continue in the work place effectively and maintain a good image with their colleagues. Also what was the nature of their breach of duty, a reason for suspension similar to Chitotela? A balancing of those factor could have been at the fore of the decision taken to suspend them, i.e Would there have been a public outcry if they were not suspended? Trib.al Hacks naiwe, unite with who? You? We cannot unite with an attention seeker, an inconsistent trib.al who does not know whether he iscoming or goibg, a totally contradictory trib.al who forgets what he said just a minute ago only to contradict himself two minutes later. Sorry trib.al, nit me or us, try your stronghold maybe there are still some who are mesmerised by you. Imwe mwefipuba mwe. You cant comprehend HH’s message? Kwena mulifikopo. #24 GK, good morning sir. What do you expect when the message is coming from ifipuba ne fikopo? Your trouble is that no serious person takes or can take, or will ever take Trib.al Hacks seriously. Refer to the indisputable facts presented by Sishuwa Sishuwa. …..trib.als like you are either not serious or have one cell for a brain. #22.4 Spaka, I have been following your argument with Patriot Abroad. Here is one of your arguments: “So then , what of all the other civil servants made to take forced leave to pave way for investigations ??? ” I wonder whether you think through what you write. Typical one celled brain, which qualifies you as a trib.al. Yes, others were put on forced leave to pave way for investigations , do why not chitotela ? I think we are missing the point in the article. It is not about HH, it is about a principle. A minister is found with cash, government tender documents, multiple accounts with deposits for work not done, several cash transactions for this en that..list goes on..and we are debating whether he must remain a cabinet minister or not? I did not once imagine that it is possible to be so blinded by partisan and hate politics to such an extent. This is not mere allegation: there is ACC with exhibits. If this minister is not dropped from cabinet and parliament, then I need to go back to school and learn what integrity and good leadership is. Breach of integrity and trust is good enough for a minister even a pinch of integrity left to step down without being fired.